Season Twenty ran from January 3, 1983 till March 15, 1983. It contained twenty two episodes across six stories. Doctor Who had finally made it to twenty seasons! As such, the creators decided to celebrate Doctor Who by having every episode this season feature a character from the show's history or reference to the past. One references the future though they didn't know that at the time. Remember that downgrade in quality I keep bringing up? Well, you can see it here as only one... maybe two of these stories are really pretty solid. Yes, the other stories are still entertaining or interesting but they're not necessarily that good. Also during this season we gain companion Turlough and lose Nyssa. However that's not technically it for this season. 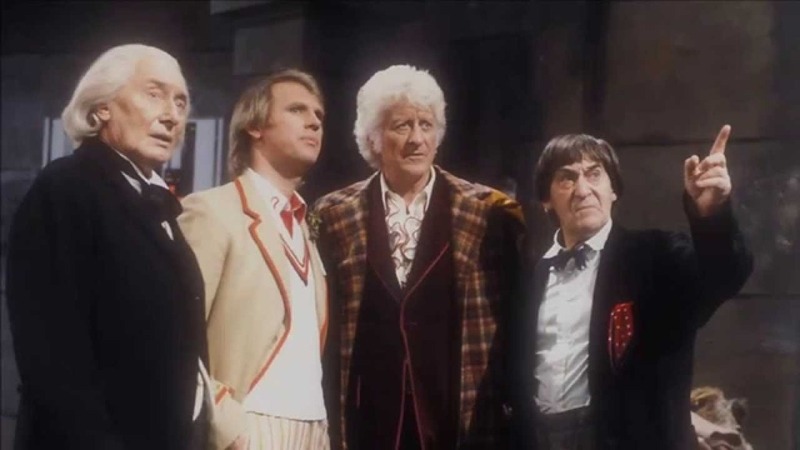 While it is a standalone story, most people include the Doctor Who 20th Anniversay Special, The Five Doctors, in with this season. It was a single 90 minute episode that ran on November 25th 1983. It was set to feature all Five Doctors and sort of does thanks to some footage from Shada. I'll talk more about it and the problems in making it below. The first story is Arc of Infinity and it's four episodes long. On Gallifrey, a traitor has found the Doctor's bio-data and has used it send The Renegade, a being of anti-matter into the TARDIS to infect the Doctor. The Doctor and Nyssa decide to go to Gallifrey because the Doctor knows the universe is in peril if this creature crosses over. Meanwhile the High Council of Gallifrey have determined to bring the Doctor there anyway and send the eager Commander Maxil to fetch the Doctor. The Time Lords recognize the danger and sentence the Doctor to death in order to stop the threat. However, the execution is faked as it seems a member of the High Council is the traitor. The Doctor is in mental communication with The Renegade who shows that he has found Tegan in Amsterdam and is holding her hostage for the Doctor's cooperation. With help from Maxil and another Time Lord, the Doctor outs the traitor and learns that the Renegade is actually the Time Lord, Omega. He quickly heads to Amsterdam. The Doctor is too late as Omega has used the Arc of Infinity to cross over into this universe, but his skin is starting to decay as the transfer wasn't stable. If he were to disintegrate it would mean the death of the universe by anti-matter. The Doctor, Nyssa and Tegan track down Omega and use a disintegration gun to return him to the realm of anti-matter. Tegan joins the TARDIS crew as a willing companion. This one is just ok. The plot is fairly confusing but it's still an entertaining ride. There is a moment where Nyssa threatens the High Council at gunpoint to let the Doctor go which was a really great scene and made Nyssa a really awesome character when pushed to her limit. This one points to the past by bringing back Omega from the 10th anniversary special The Three Doctors. It was neat to see an old villain most people had forgotten but I wish they hadn't changed the costume. His old one was much more fierce and cool. This one also unknowingly points to the future as Colin Baker, the 6th Doctor plays Commander Maxil. Funny story, Colin Baker was asked to tone down his performance because they felt he was out-acting the main characters (which was true) and he refused saying that everyone should act like they are the star of their own show. Its during the filming of this story that he became friends with the production crew and that is what ultimately lead to him being the Doctor next season...but I'll get to that in another talk. This one is entertaining enough so give it a watch if it sounds interesting. The next story is Snakedance and it's four episodes long. 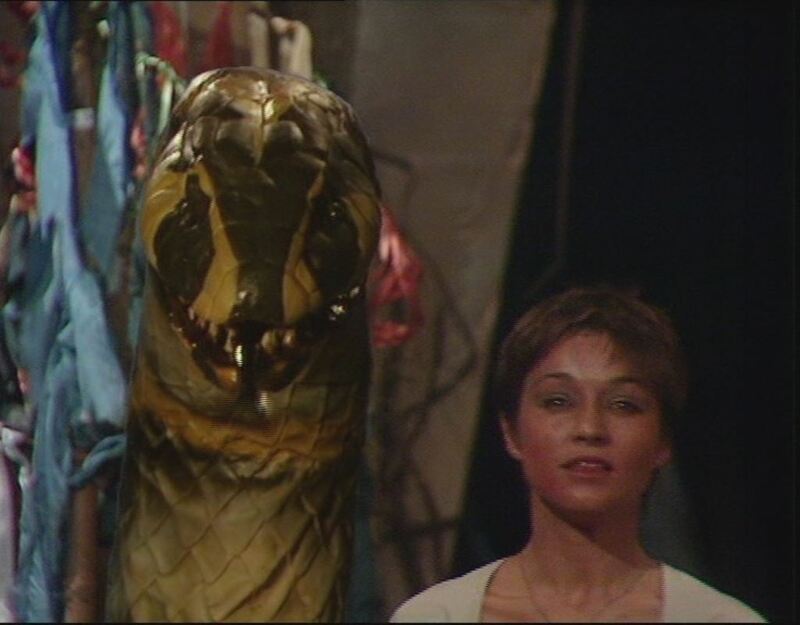 When the TARDIS lands on Manussa, Tegan begins having nightmares of snakes once more. The Doctor is afraid that the Mara is trying to return to her mind and attempts to calm her down by taking her to the cave from her dreams. Instead, she runs away frightened and eventually succumbs to the Mara once more. The Manussians are to celebrate the 500 years since the Mara was defeated on their planet and the leader's son, Lon is to take place in the ceremony. Unfortunately for Manussa, the possessed Tegan finds Lon and marks him with the snake mark. They intend to use the Great Mind's Eye crystal during the ceremony to allow the Mara to become a living being once more. The Doctor and Nyssa try to find a way to stop this and discover an old psychic snakedancer who explains the only way to defeat the Mara is with a still place in the mind. 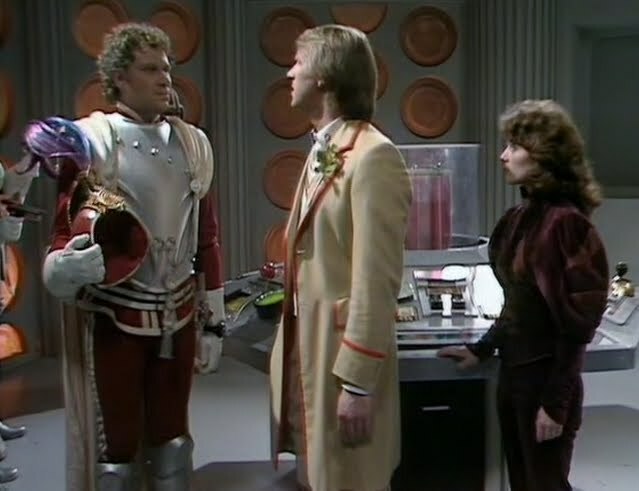 As the Doctor and Nyssa rush to the ceremony, Lon places the crystal in the wall and summons the Mara. The Doctor finds a still place in his mind and refuses to look upon the giant snake thus causing an interruption and the Mara turns to ash. The Doctor then comforts Tegan that the Mara is finally gone for good. It's not too incredibly often that you get a direct sequel to another story in Doctor Who, but here another one sits. This is of course the sequel to Kinda from last season and our mention of the past for the episode. This one, like Kinda is good. Janet Fielding does an excellently creepy job of playing the possessed Tegan toying with people. While the giant snake effect is still not fantastic, it doesn't take away from how good this story is. If you liked Kinda then you should enjoy this. The next story is Mawdryn Undead and it's four episodes long. Brigadier Lethbridge-Stewart has retired from UNIT and is teaching math at a local school. There, a boy named Turlough (who is actually a stranded human-looking alien) steals the Brigadier's car and crashes it. While unconscious, Turlough is contacted by the Black Guardian who offers Turlough passage off Earth in exchange for the Doctor's death. Turlough accepts and is sent to a star liner stuck in a perpetual time loop. The TARDIS has also landed on that same star liner being sucked into the time loop. The Doctor meets with Turlough and agrees to go with him via transmat back to earth in 1983. There Turlough attempts to murder the Doctor but cannot do it. 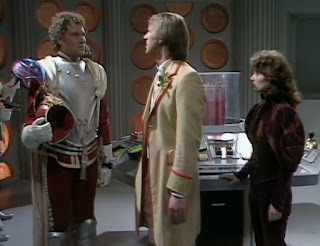 The Doctor asks Nyssa and Tegan to fly the TARDIS down to them, however the machine appears then immediately disappears. Trying to find out what happened the Doctor finds Lethbridge-Stewart but he has no memory of their adventures; some trauma had happened to him to make him forget. However he does remember seeing Tegan and a TARDIS in 1977. While in 1977, Tegan and Nyssa meet the younger Brigadier and find an injured alien in a pod they mistakenly think is the Doctor. The alien says the ship will have the means to heal him so the three take him back to the starliner. The Doctor, Turlough and the older Brigadier return to the star liner as well. It turns out the star liner is full of scientists trying to tap into the Time Lord's regeneration ability but are stuck as undead beings unable to die. Eventually both the younger and older Brigadiers meet and touch hands causing a temporal explosion which allows the scientists to finally die and causes the trauma making the Brigadier forget. The Doctor accepts Turlough as his newest companion unaware of his deal with the Black Guardian. The next story is Terminus and it's four episodes long. The Black Guardian gives Turlough another chance to kill the Doctor and orders him to sabotage the TARDIS console. This causes the ship to sort of fuse with another vessel and forces the Doctor to land the TARDIS on the ship. The ship is called Terminus and it is basically a leper colony trying to find the cure. Nyssa quickly becomes ill and is taken by the slave-like labor force who need a chemical provided by the company to live. She is handed over to the dog-like Garm who is trying to treat people with radiation. The Doctor meanwhile discovers that there is a problem with the ship's fuel and if it jettisons said fuel like the computer is planning to do it will cause a massive explosion wiping out many planets. The radiation treatment works on Nyssa and the Doctor helps the Garm to be free from his masters. With the Garm's help the Doctor is able to disconnect the computer. The TARDIS crew go to leave but Nyssa decides to stay behind and use her scientific knowledge to help the Garm refine his radiation treatments and turn Terminus into a true hospital. The Black Guardian is angry with Turlough and tells him that he only has one more chance or else he will die. These actual episodes are pretty boring if I'm being honest here. Truly three companions are too much as once again Tegan and Turlough spend much of their time just sitting around. What's more interesting about this story is what was going on behind the scenes. Sarah Sutton's contract with the show was expiring. She didn't want to have Nyssa leave. Peter Davison asked to have her remain on as he felt Nyssa was the perfect companion to his Doctor (and in many ways he was right.) Even the script writers didn't make it that apparent she was leaving in the episode. You could tell the writer didn't want to write her out either but yet Turlough was brand new and Tegan had just come back so the end was inevitable for Nyssa. The next story is Enlightenment and it's four episodes long. After some interference by both the White and Black Guardians, the TARDIS crew find themselves on an Edwardian ship in space. The leaders are of a race of Eternal beings and have hijacked humans and vessels to participate in a race out of their sheer boredom. The prize is Enlightenment, the power to know all things. 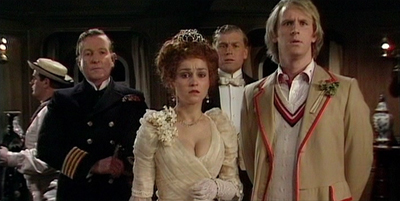 The Doctor begins to get suspicious of sabotage as some ships are seen to be blowing up. The Doctor, Tegan, and Turlough go to the ship's deck, but when the Black Guardian mentally taunts Turlough he decides to end his suffering and jump overboard. Turlough is then picked up by a pirate ship whose captain also serves the Black Guardian. After some spying around and more sabotage, the Doctor and Turlough eventually work together and overthrow the pirate ship finishing the race in first place. This causes the other ships to disappear and the human crew to return to their times and lives. The White Guardian then dismisses the eternals back into their plane of existence. The crystal Enlightenment stands before them but the Doctor refuses his prize. However he says Turlough is entitled to a portion of the prize as he helped. The Black Guardian reminds Turlough of their agreement and says that he can give up the diamond or kill the Doctor and gain both Enlightenment and the TARDIS. Turlough refuses and throws the diamond at the Black Guardian who bursts into flames; their agreement permanently ending. The Doctor points out that Enlightement was never the diamond, but the choice. This one is surprisingly good. Maybe I'm just a sucker for a good race story but I honestly really enjoyed this one. Mark Strickson did a fantastic job showing the turning point and darkness of Turlough throughout this story. It was also neat to see other powerful beings in Doctor Who. Most alien races are on-par or less than the Doctor but just in large doses. Here, however, we have multiple beings of immense power and the Doctor is more or less just a guy who does good stuff. Check this one out, you may be surprised by how good it is. The last story of the season is The King's Demons and it's two episodes long. The court of King John of England is staying at a noble's castle. When the King insults the head of house, the man's son challenges the King's champion Sir Gilles Estram to a joust. The son loses quickly but the joust is interrupted by the landing of the TARDIS. 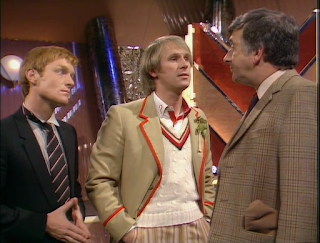 King John greets the Doctor, Tegan and Turlough as friends calling them "my demons." Things become stranger when the Doctor finds the exact date and realizes King John would actually be taking the Crusader's Oath at this point and not at this castle. The Doctor gets into a fight with Sir Giles Estram for him to reveal that he is actually the Master and runs off in his TARDIS. The King knights the Doctor as his new champion but things still aren't adding up. 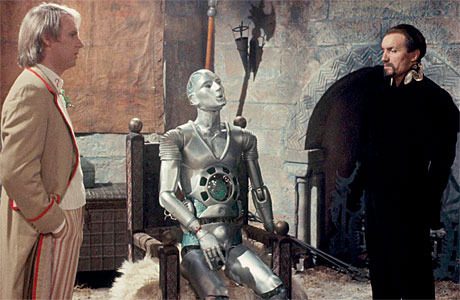 Eventually the Doctor confronts the King to find that he is actually a shape-shifting robot named Kamelion under the control of the Master. The Master plans to use Kamelion to make the King behave so terribly that it will cause a revolt and topple the real king from the throne thus stopping the Magna Carta. The Doctor and the Master mentally fight for control over Kamelion with the Doctor winning and sealing Kamelion into the TARDIS. This one.....what?? So let me see if I got this straight. The Master intends to topple the foundation of parliamentary democracy in England by making the King behave so badly that it will cause a revolt and not allow him to sign the Magna Carta...when in reality King John was so unpopular that his behavior caused a revolt which had him sign the Magna Carta. I.....freaking what?? Don't get me wrong it's an interesting two parter but the Master's plan makes no sense. This also introduced the companion of Kamelion and if there's one companion you didn't know about it's probably him. Why? Well he appeared in this story and makes another appearance in the 4-part Planet of Fire and that's about it. All six episodes he's being used by the Master for evil purposes. The backstory on Kamelion? Well John Nathan-Turner thought it would be a great idea to have a shape-shifting robot that was played by an actual robot. The problem was that the creator was the only one who could control him...then the creator died meaning no one could control him. This is a really really weird two parter that I suggest only because of how bizarre it is. The next story is the special 90 minute episode The Five Doctors. A strange figure beings to use a Time Scoop to bring various incarnations of the doctor, some of his companions, and some of his enemies into the Death Zone on Gallifrey. The First, Second, and Third Doctors along with Susan, Sarah Jane, and the Brigadier are successfully brought along with a Dalek and some Cybermen. When the figure tries to get the Fourth Doctor and Romana they are stuck in a time vortex. The Fifth Doctor feels the effects of his previous selves being ripped from time and collapses. The various Doctors realize where they are and with their companion head towards the large tower in the center of the area avoiding traps along the way. The High Council of Gallifrey has notices the Death Zone becoming active again and the Doctors being taken from time. Reluctantly they offer the Master a full pardon and new set of regenerations in exchange for helping the Doctor. The Fifth Doctor pilots the TARDIS to the Death Zone and meets the Master who is knocked unconscious by Cybermen. The Fifth Doctor uses the transmat device the council gave the Master to return to the council room. Eventually he discovers that it is President Borusa who has been using the Time Scoop and is intent upon become the Lord President Eternal by claiming immortality from Rassilon's tomb in the center of the Death Zone. The other three Doctors and their companions convene at the tomb, find a way to allow the TARDIS inside the tower, and find a riddle that those who lose shall win and those that win shall lose. 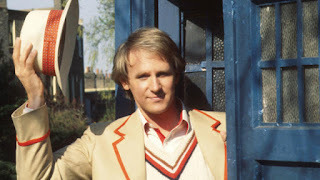 Borusa forces the Fifth Doctor to go with him and claims immortality for his own. The voice of Rassilon appears and grants Borusa his wish, turning him into a living stone statue. Rassilon then uses his mental powers to return the Master to his time and un-freeze the Fourth Doctor. He offers immortality to the remaining Doctors who all refuse and return with their companion to their time stream. This story is an absolutely excellent piece of Doctor Who history. It takes a look back at the entirety of the twenty years of Doctor Who to see where it has been. It is a celebration of everything Doctor Who. There are a couple of unfortunate circumstances that made the story not that fantastic at point. Frazier Hines (Jamie) was supposed to play a larger part but had to back out forcing some re-writes. Then Tom Baker refused to be a part of the project so there had to be even more re-writes which was to the story's detriment. Don't come here for an excellent story...come here for a celebration of all things Doctor Who. It's fantastic to see all of these old members of the show. We get to see Susan, Sarah Jane, and the second and third Doctors again. We also get brief cameos of Zoe, Jamie, Mike, and Liz. Thankfully the story starts with William Hartnell's speech from The Dalek Invasion of Earth. I hate that Hartnell had passed away by this point but we still get to see the First Doctor Let's also talk about Richard Hurndall who plays the First Doctor. This is the first and only time that a previous Doctor has been played on-screen by another actor. Hurndall does an excellent job at capturing the First Doctors gravitas and spirit to the point that the Carole Ann Ford (Susan) was almost brought to tears because she had effectively seen Bill again. Also as a last note, it was during the filming of this story that Patrick Troughton advised Peter Davison to do the role for three years then walk away. This was advice he heeded and passed on to David Tennant who basically did the same. If you like the classic Show then this is a must see...if for no other reason than seeing a robot take out an entire platoon of Cybermen single handed. That was season twenty. In my opinion it's objectively worse than the previous season however it doesn't have any absolute disasters like Time-Flight was. It's kind of hard to classify this season because there were a lot of ideas and moments that were more interesting than last season but it's also a lot more dull than last season. I guess it just depends on your personal feelings. The Five Doctors, however, is amazing. Please join me again as we continue to examine all of Doctor Who. Ghost's Arcade: Is Nuzlocke Really Worth It?